The government is being urged to use the forthcoming Autumn Budget to restore stability to the automotive market following the seventh consecutive month of decline in new car registrations. Figures from Society of Motor Manufacturers and Traders (SMMT) show 158,192 new units registered in October, 2017, a year-on-year drop of 12.2 per cent attributed to falling confidence among buyers. According to SMMT, declines were seen across all sectors, with business and fleet demand down -26.8 per cent and -13.0 per cent respectively. Dealers also reported -10.1 per cent fewer private buyers taking delivery of new cars in the month. 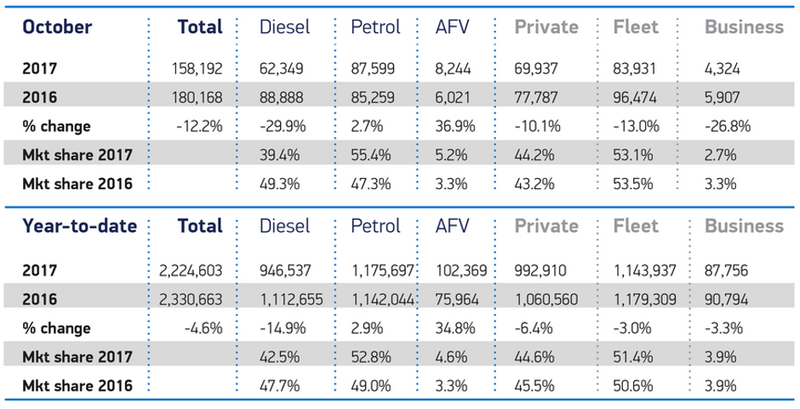 Alternatively Fuelled Vehicle (AFV) demand continued to rise, up 36.9 per cent to 8,244 registrations, while petrol models enjoyed a more modest growth of 2.7 per cent. These gains were unable to offset losses in the diesel segment where demand has dropped by 29.9 per cent. Year-to-date, the overall market is down 4.6 per cent on 2016 levels, with 2,224,603 cars registered in the first 10 months. This aligns with SMMT’s latest forecast for 2017, published last week, with the market expected to end the year on 2.565 million units, which represents a 4.7 per cent decline. Mike Hawes, SMMT chief executive, said: “Declining business and consumer confidence is undoubtedly affecting demand in the new car market but this is being compounded by confusion over government policy on diesel.